If Barbie was real, what would one of her favorite foods be? One doll-house accessory manufacturer believes the answer is nachos and we agree 100%! 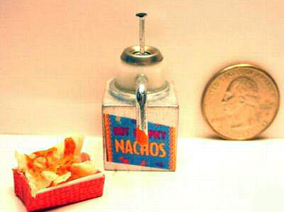 To back up their claim, this company has even designed a miniature nacho cheese set! To any of you nacho cheese lovers that have children who play with dolls, this is a must have accessory! By the looks of her waist, Barbie is dying of starvation. Please help Barbie live by feeding her a nice plate of nachos! I have to go through my blogroll once and drink my coffee before I can officially start my day and this, about the teeny Barbie nachos, is my favorite post of the morning! Next Next post: Jesus Christ Nachostar!